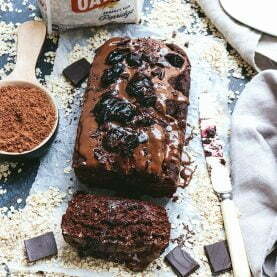 The addition of oatbran gives this easy bread a lovely nutty flavour and provides a great source of fibre and protein. Slice the loaf thickly to make sandwiches or spread with your favourite jam. 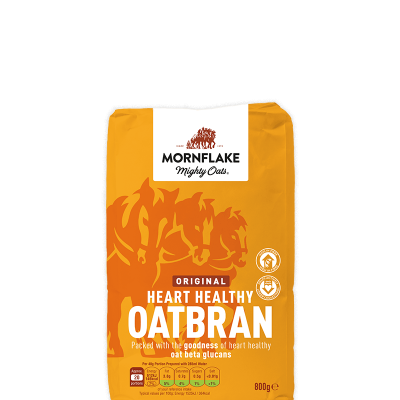 Weigh the wholemeal flour and oatbran into a large mixing bowl. Add the salt to one side of the bowl and yeast to the other. Pour the olive oil into the flour and a little of the water and start to mix all the ingredients together with your fingers. Continue to add the water a little at a time and knead together until it forms into a dough and all the flour is amalgamated. Sprinkle some of the wholemeal flour onto a clean worktop and tip the dough onto it. Knead the dough for about 6-10 minutes until the dough is smooth. Wipe the base of the bowl with little oil and return the now kneaded ball of dough to the bowl. Cover with cling film/tea towel and leave to rise at room temperature for about an hour, until it has doubled in size. Lightly oil a 1kg loaf tin and set to one side. Flour the worktop and tip the dough onto it. Knead the dough again, knocking the air out of it – this will take a few minutes. Form the dough into a rough oblong shape that will fit into your loaf tin. Put the dough into the prepare tin, recover and leave for a second prove for about 1 hour, until it has doubled in size again. The dough should spring back slightly when touched with a finger. 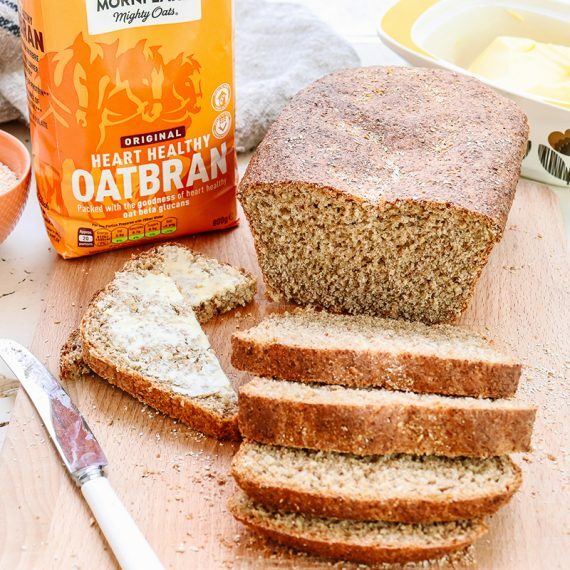 Sprinkle the top of the loaf with some oatbran. Put the loaf in the oven on the middle shelf and bake for 30 minutes. To check the bread has cooked carefully tip the loaf out of the tin and tap the base – it should sound hollow. Take the loaf out of the tin and leave on a wire rack to cool. Store in a bread bin and eat within 4-5 days.